When it comes to skincare, all I want is effective formulations at an affordable price point and Merumaya hit the mark perfectly. Founded by the wonderfully passionate and hard-working Maleka, this British brand is celebrating its 5th birthday with an amazing limited edition gift with purchase. It’s the perfect time for Merumaya fans to stock up on favourites and for anyone wanting to try out the brand to jump aboard. If you're not sure where to start, I've got my top picks here for you today. At the beginning of the year I did a Brand Focus discussing the brand so feel free to have a read if you’d like to learn more about the brand philosophy. My top recommendations are the products I truly love to have in my skincare routines, that I’ve either already repurchased or have used up completely and will definitely use again. Merumaya Melting Cleansing Balm - This has become somewhat iconic and with good reason. Enriched with echium oil, this delicately sweet scented balm has a sophisticated gel texture and melts off makeup quickly and effectively without irritating the eyes or drying out the skin. This would suit even the most sensitive skin types and is a delightful way to begin the evening skincare routine. If you are a fan of cleansing balms then you definitely need to try this one because for me its one of the best around. Merumaya Treatment Toner - I’ve said it before, I’ll say it again: this is one of the best skincare products I’ve ever tried and can see myself repurchasing this forever. Already onto my 3rd bottle with another back-up bottle in the stash, my love for this should be obvious. I use this gentle multifunctional toner every morning after cleansing to hydrate, soften and lightly exfoliate. It is so soothing on the skin and I find it plumps and brightens without aggravating my skin. It contains hyaluronic acid alongside brown & micro algae and amino acids to help skin retain moisture and over time helps with tone and texture. I cannot recommend this product enough. Merumaya Retinol Resurfacing Treatment* - This ultra gentle formulation helps to refine the skin’s texture and smooth out the appearance of fine lines. The natural glow my skin achieves when I consistently use this product is undeniable. What makes this treatment special is that it combines the effectiveness of retinyl palmitate with a whole host of soothing, repairing and moisturising ingredients to really deliver a treatment that works but doesn’t irritate the skin. If you are new to retinol products or you’re looking for something gentle to use in between more harsh treatments, this is the way to go. The free gift with purchase is available on all orders made at merumaya.com when you spend over £25 and comes with a whopping £56 worth of products. This is a limited time offer. The GWP promotion runs from today until Thursday 19th October so hurry to place your orders!!! Its such a great bargain and not to be missed. 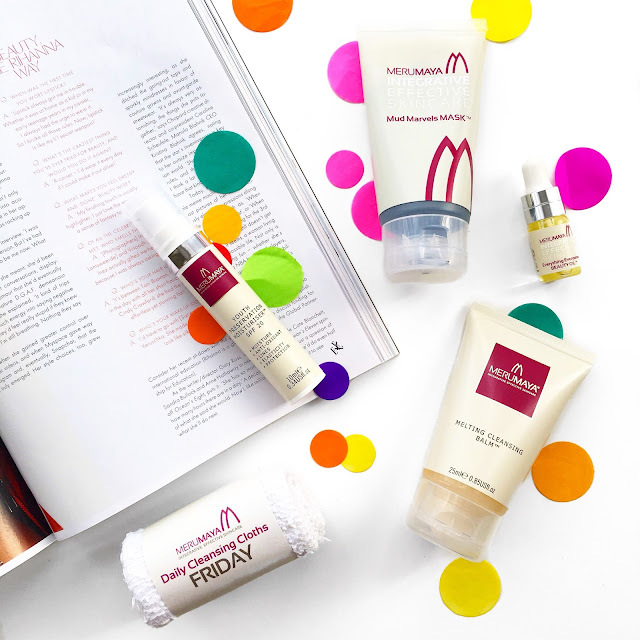 Congratulations to the lovely Maleka and her wonderful team as they celebrate their 5th anniversary for Merumaya :) I have loved using their products over the last year and can't wait to see how they grow and what else they bring to the market.